After Barack Obama’s new programs to help employers, automakers, homeowners, the unemployed, and state and local governments, here are John McCain’s new economic proposals ($52.5 billion) to relieve financial distress on the nation’s seniors, workers and the unemployed. 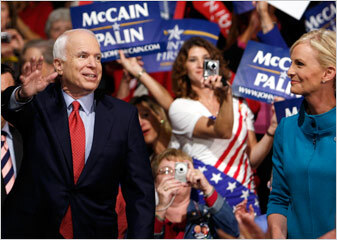 The proposals come the day after McCain delivered a speech focused more on what he would do as president and less on his recent personal attacks on his rival—better late than never, I’d say! No more wild overleveraging, no more liabilities concealed from the public and from shareholders, no more bundling of assets to maximize profit by assuming insane risks. Those days are over on Wall Street. With new rules of public disclosure and accounting, my reforms will make certain these betrayals of shareholders and the public trust are never repeated.